Y’all know me and the pack have a job taste testin’ new dog treats don’t cha? Yea, it’s a real hard job, but someone’s got it do WOOF! To be straight with ya, we really don’t mind and we take our job purdy darn serious! It’s actual right nice to try out the latest bestest flavors and tell our friends about em! The other day, them folks over at Chewy.com sent us some Castor and Pollux Good Buddy Cheddar Cheese Flavor Dog Treats to see what we thought about em. Before we do our job, all dog treats and dog cookies have to pass my Lady’s approval. Gettin’ her approval is sometimes hard. But, she’s a lookin’ out for us by makin’ sure they are good for us. I’m gonna let her tell ya the scoop on our new Good Buddy Dog Cookies! My pack loves treat time! All you have to do is say ‘cookie’ or ‘treat’ and you can watch the ears go up! They are all good furbabies and I love spoiling them! 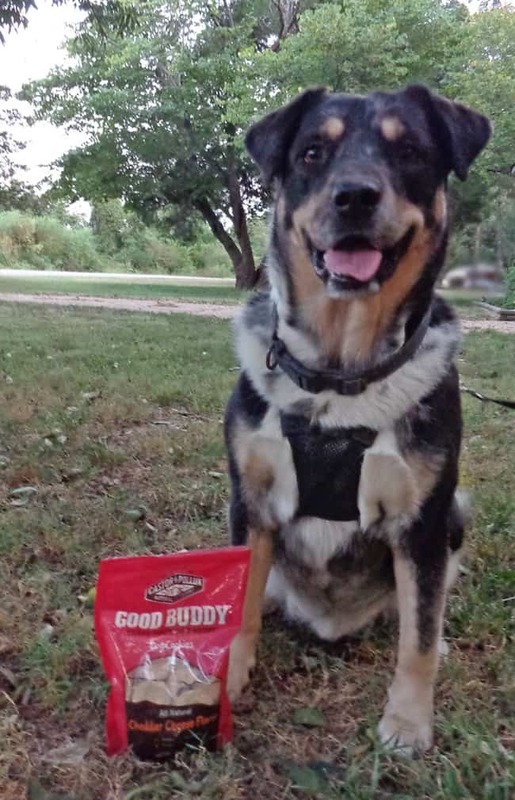 Castor and Pollux Good Buddy Dog Cookies are delicious and healthy dog treats. Good Buddy Cheese Flavor Dog Treats include natural ingredients. They are made using whole wheat flour, rolled oats, canola oil, cheddar cheese, whey powder, garlic powder, eggs, and dried kelp. They are naturally preserved with mixed tocopherols, which is a form of vitamin E.
They are oven-baked to golden goodness and have a crunchy texture. The Good Buddy Cheese Flavor Dog Treats must smell appetizing too, because the pack wasted little time in sniffing and went straight for gobbling them down! Most importantly, they are made right here in the USA! You can also see that the Good Buddy Dog Cookies are fairly good sized. While my extra large German Shepherds wanted a second cookie, one was more than enough for my little chihuhua. I broke it into fourths for her to tackle. All the dogs gave them a definite paws up for taste! I give them a thumbs up for the very generous amount of cookies in the bag at such a reasonable price! I can afford to give seconds, which will make them happy! Does your little buddy like cheese? Why not give these Castor & Pollux Good Buddy Cheddar Cheese Flavor Dog Treats a try! You can find them at Chewy.com very reasonably priced! Right now they are even on sale for $3.79 a bag!!! I’m sure going to stock up! For more information about Good Buddy Cheddar Flavor Dog Treats visit Chewy.com. Fan them on Facebook and follow on Twitter! You don’t want to miss any of the yummy pet treats, dog food and more from Chewy.com! These treats look very tasty. I love that they have all-natural ingredients. These look so good I have 3 recues and I know they would love to try them too. Made in the USA is so important when I buy food for my cats and dogs. The Good Buddy Cheddar cheese Dog Treats sound so good for the dogs. I too always check to see where they are made. Being made in the USA is a 100% Yes! The ingredients are awesome too! Thankyou for this informative review!! 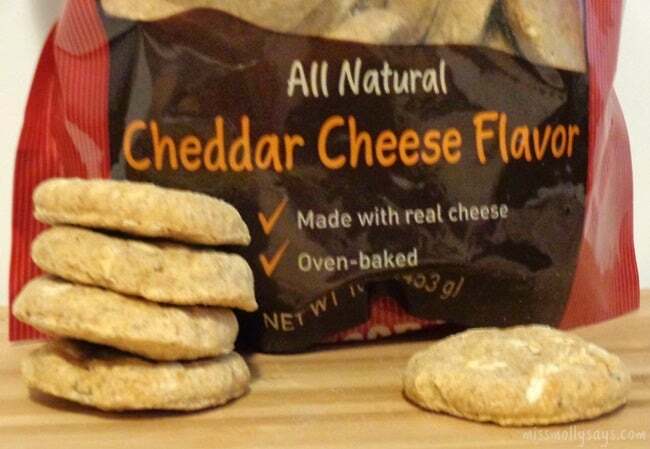 Good buddy cheddar cheese flavor dog treats sound great, I’m sure my dog would love these. Glad there made with all natural ingredients and made in the USA. This looks very good and healthy for my dog. I don’t really have time to make treats myself and this looks excellent. I love that they add kelp. My doggies would love them too! The easiest way to make them listen is to say the word Treat loudly! I appreciate pet foods and treats that are made with healthy, pronounceable things! I admire your efforts and your dog’s efforts on evaluating pet treats. My dog eats everything so she would not be good at this. I will have to try these when we travel as she need extra incentive to be patient. I will have to get these for my fur niece Miss Abby. Great review! I think I will try these for my little Bella. Love that they are made with all natural ingredients and are affordable too! We have a grand dog that we like to spoil, so thanks for the review about these dog treats! I want to try them. My little dog is so dang picky. I will try anything. These sound like some good treats! I’m sure my pups would love them. Nice review for a product my pups will devor! I’m always trying to find new treats that are natural, healthy and tasty! Thanks for the heads up and info! Always looking for new ideas for my favorite family member. This is great and love how it is natural ingredients. Both of my chihuahuas LOVE cheese! I would definitely give them these treats! Thanks for sharing! My dogs would love these treats. I love them because they are made in the U. S. and because they are made from all nature ingredients. Thanks for sharing. this sounds like something my dogs would love! I like the fact that its made in the usa. My dog loves the taste of cheddar cheese so these snacks would be perfect. They’re at a good price too. Thanks for the tip! I love that they are all natural and made here in the USA. I would feel confident in giving them to Sorcha and thank you for the review.